Fishing and hunting guide Captain Chris Dollar brings up-to-date sporting life insight to the Bay Bulletin. Check in weekly to see what’s happening out there. Chesapeake water temps remain almost as hot as the fishing. Red drum, cobia, and Spanish mackerel are just a few species in good supply. The catch-of-the-week goes to Annapolis resident John Loe who landed and released an 85-pound tarpon while fly fishing the seaside shallows of Virginia’s Eastern Shore. 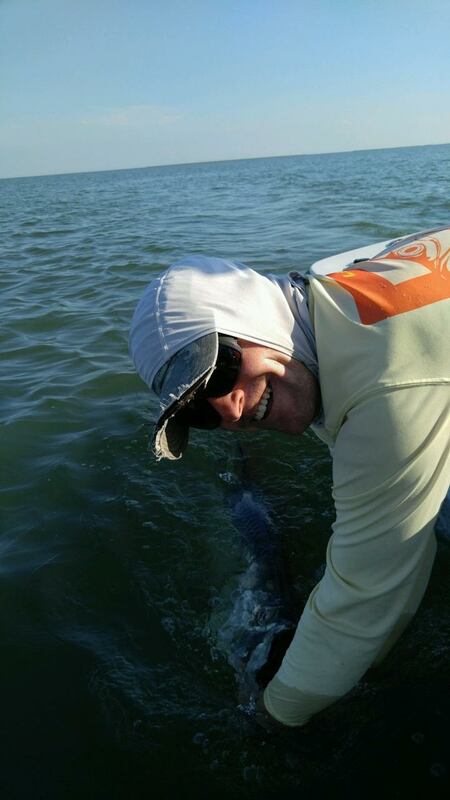 He’s now a member of a very exclusive club, catching perhaps only the third tarpon ever in Virginia waters on a fly. Loe, guided by Capt. Ken Eshelman of Cape Charles Fishing Adventures, was casting an 11-weight fly rod with a 15-pound tippet. The fish dragged the boat nearly two miles and took an hour and a half to land. “It’s the new [Virginia] size record and is believed to have been the furthest north of any tarpon caught on fly, ever,” he told me the other day. He demurred when I asked him the type of fly, understandably. Congrats to both angler and captain. Runner-up is the bull red drum explosion that went off this past week, chiefly between Point No Point and Point Lookout. Some reds topped 50 inches and, reportedly, will hit 7- to 10-inch soft plastics (BKDs, ZMans, Hogys) on 3/4- to 1-ounce jig heads. I was also told some anglers got them to eat top water plugs. Be prepared to run the boat to find them. In Virginia, a 42-pound king mackerel was caught this week, prompting anglers to try fast trolling the Virginia Beach oceanfront. There are lots of Spanish mackerel around as well. Some are citation worthy. Dr. Ken Neill, III of the Peninsula Salt Water Sport Fisherman's Association and Stan Simmerman went for kings; no luck there though they boxed plenty of smoker-sized Spanish as well as 50-inch cobia. Bottom fishing for white perch, spot, and some croakers is as good as it gets pretty much everywhere on live bottom lumps. Try the mouth of the Potomac and Patuxent rivers and the waters inside Hoopers Island and Tangier and Pocomoke sounds. I wouldn’t call the croakers “thick,” but it’s better than last week. Use bloodworm bits on #2- to 4-gold hooks for spot and use peeler crabs for the hardheads. Almost all of the reefs and wrecks off of Ocean City, Wachapreague, and Indian River Inlet have a pretty good mix of flounder, bluefish, sheepshead and sometimes triggerfish. 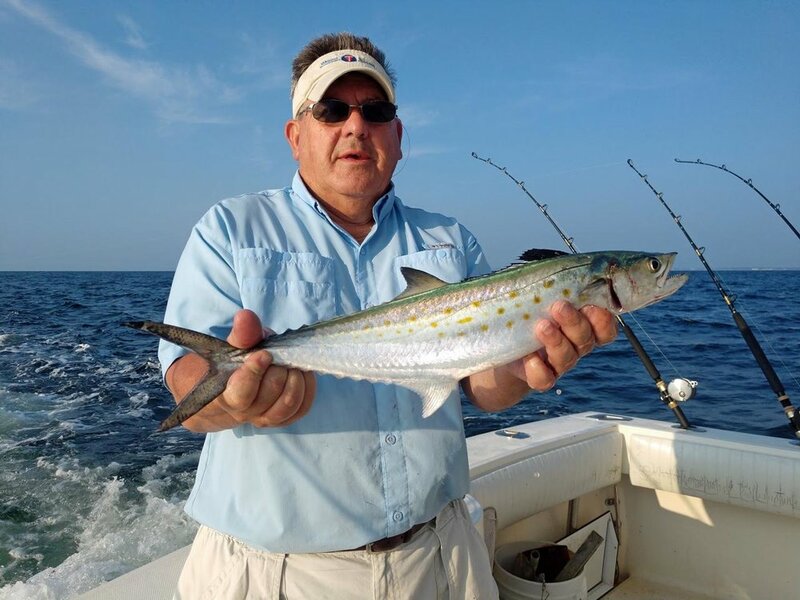 Surf fishing is on the slow side, but expect the kingfish and croaker bite to improve as we get closer to Labor Day. Effective baits are sand fleas, clams, squid, and cut mullet. Upper Bay anglers should try live-lining spot or white perch for rockfish at the Bay Bridge pilings but be ready for the crowds. The western shore lumps from the South River to the Patapsco River continue to give up lots of catfish. They’ll hit bloodworms, clams and cut bunker. For trollers, work the 22- to 37-foot ledges from Swan Point past Love Point, dragging tandem Tsunamis or bucktails in baitfish colors or Mountain Dew green.